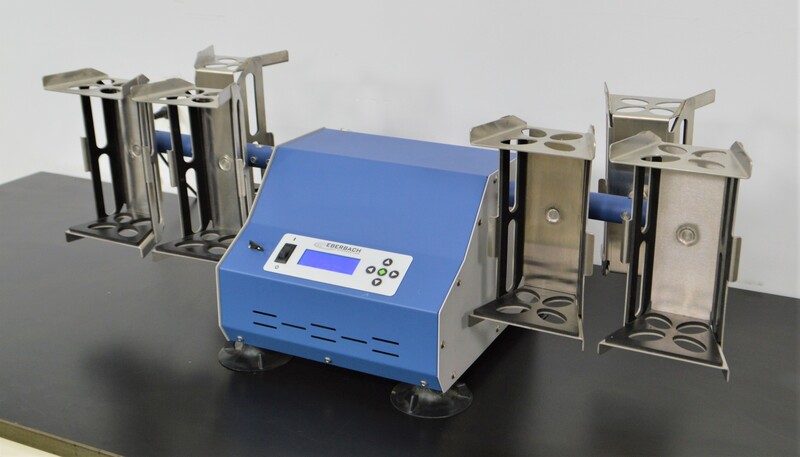 Eberbach Model EL680 HD Heavy Duty Hand Motion Shaker w/ 6 Holders Sample Prep . New Life Scientific, Inc. This Eberbach EL680HD is in great working and cosmetic condition and includes six stainless steel holders. This shaker is a heavy duty model, having a max load capacity of 10 lbs, allowing for large volumes of samples to be processed at a time. It also has detachable arms that can be customized to hold many types of tubes, flasks, and bottles. This shaker would be an excellent choice for any laboratory needing a tool to speed up the process of extracting, dissolving, and emulsifying samples. Our in-house technician visually inspected, initialized, and tested the Eberbach EL680HD, confirming it to be fully functional. The hand motion shaker was tested to the max shaking speed, 960 osc/min. The weight and rubber feet of the shaker assist in keeping it stable, but a sturdy surface is necessary to safely run this near max shaking speed.